Recife Metropolitan Area is the eighth largest metropolitan area in Brazil with a population of 3.9 millions. Its area of influence (4th largest in Brazil) covers the entire states of Pernambuco, Paraíba, Alagoas in addition to the countryside of the states of Rio Grande do Norte, Piauí, Maranhão, Ceará and Bahia. Its main city is Recife with 1.66 million inhabitants, capital of Pernambuco. Guararapes International Airport, also known as Gilberto Freyre International Airport, is the airport serving Recife. The region is served by Suape and Recife ports. Recife Metro, the second largest in Brazil, after São Paulo. Since 1998, an extension to the Recife Metro is being built. When ready, it will become the second largest in Brazil, after São Paulo. This system also integrates with several bus lines connected to the bus/metro integration terminals, such as Barro and Joana Bezerra stations. It is possible to ride the metro and the connected bus line by purchasing one ticket only. Since March 2009, Recife Metro has finished one more phase of expansion. The system counts now has 28 stations (11 integrated with buses) and is 39.5 kilometers long. Buses transport almost two million passengers daily. ^ "Recife metropolitan area profile". Brookings Institution. Retrieved 6 May 2016. ^ Recife Metro (in Portuguese). Recife, Brazil: Diário de Pernambuco. 2006. ISBN 85-240-3919-1. Archived from the original (PDF) on 2008-02-02. Retrieved 2007-07-18. 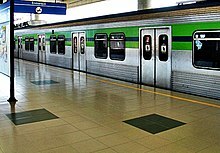 ^ Recife Metro (in Portuguese). Recife, Brazil: CBTU. 2006. ISBN 85-240-3919-1. Archived from the original (PDF) on 2008-02-02. Retrieved 2007-07-18.